Minister Gan outlined the key objectives and underlying principles of the Master Plan. From predictive analytics for identifying readmission risks to personalised information based on life journey points, from artificial intelligence to robotics-assisted home care, the Ministry of Health (MOH) in Singapore has ambitious plans for transforming Singapore’s healthcare system by leveraging technology. 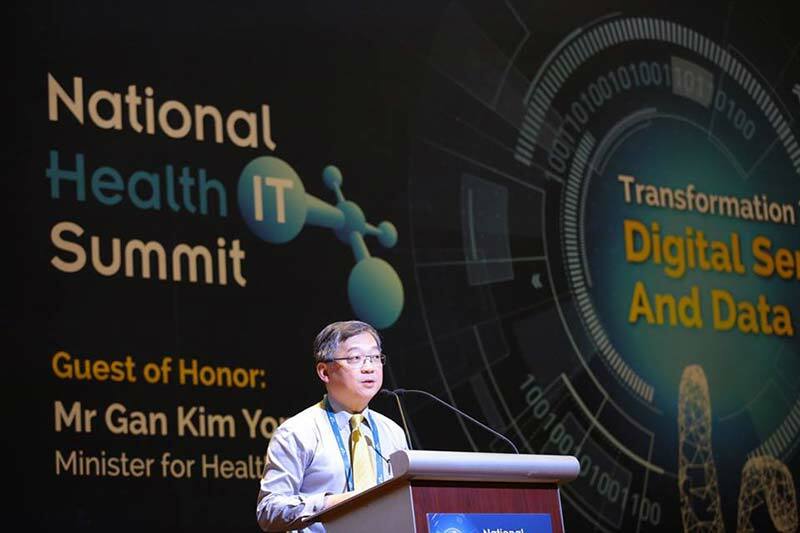 At the National Health IT Summit 2017 on 30 May 2017, Mr. Gan Kim Yong, Minister for Health, revealed the strategic Health IT Master Plan (HITMAP), that has been guiding the healthcare sector’s IT programmes since 2014. In his speech, Minister Gan outlined the key objectives and underlying principles of the Master Plan. He spoke about some specific applications of technology MOH is looking into. The 3 ‘D’s are Going Digital Intelligently; Using Data Effectively and Disrupting Meaningfully, supporting going beyond healthcare to health; beyond the hospital to the community and beyond quality to value. The MOH is emphasising three areas in which to go digital. The first is health records. Over 760,000 patient record searches are made monthly on the National Electronic Health Record (NEHR). To encourage faster and wider digitisation of records by private and Voluntary Welfare Organisation (VWO) healthcare providers, the government has been providing funding through through the Centre-Based and Home-Care IT Enablement Programme Fund, which has disbursed over S$2million over the last two years. Secondly, patients can become more informed and active partners in their own health. The Health Information Board (HPB) has started the Health Hub to facilitate this. “Today, users of the HealthHub receive selected health articles based on their individual profiles. They can also input their vital signs such as BMI, weight, or blood glucose to monitor their health. HPB is also making HealthHub more relevant to Singaporeans with different conditions and at different points of their life journey. Those at risk of diabetes can now enrol in a digital-enabled diabetes prevention programme. Pregnant women can receive guidance during their pregnancy. After delivery, they and their spouse can track their baby’s growth and developmental milestones through the eHealthbook,” Mr. Gan said. MOH is also using digital technologies to bring care beyond the hospitals to the community. During the past 2 months, the Smart Health Video Consultation and TeleRehab have been rolled out. A Vital Signs Monitoring System will be launched later in 2017. Data can enable the identification of cost-effective clinical practices, reducing costs, without any drop in clinical outcomes. In addition to looking for opportunities for such value-driven care, MOH will focus on predictive analytics. IHiS (Integrated Health Information Systems) together with NHG (National Healthcare Group), NUHS (National University Health System) and SingHealth, have developed a predictive model for identifying discharged patients who are at risk of multiple readmissions and enables proactive early intervention to be provided to better support them. A Hospital to Home programme enabled by this model is targeted to serve some 19,000 patients in FY17. Going forward, MOH and IHIS will work with partners like GovTech (Government Technology Agency of Singapore) and AI.SG to integrate more applications of data, and maybe artificial intelligence into healthcare. To support this, the MOH is developing the Health Marketplace, to aggregate demand and provide matching services in the home care space. Nursing services was offered on Health Marketplace via a “match-a-nurse” service late last year. By the end 2017, the Agency for Integrated Care (AIC) and IHiS will put together a healthcare consumables marketplace for Singaporeans. Personal care services, medical transportation, meals-on-wheels, and therapist services will be progressively added to the platform. MOH will support the trial use of robotics in healthcare, with funding support from the National Robotics Programme. Prototypes of smart wards will be developed and these will be integrated with smart logistics for hospitals of the future. In line with the shift of care from hospitals to community, MOH will explore robotics-assisted home care. The Centre for Healthcare Assistive & Robotics Technology (CHART) to take the lead in this area. IHiS will support CHART and institutions in the technology enablement. This includes the development of a standardised healthcare robotics framework. Minister Gan said that coordinated large-scale initiatives, as well as support ground-up efforts would be required on the digital health journey. Read the complete speech here.